I hope to inspire and entertain you with a lot of sewing and a little of everything else! This little dress is a sweetie. I love how it turned out. Almost as quick to make as a regular peasant dress, this one is more shapely with the addition of a waist and gathered skirt. The pattern is the Monkeysbug "Petticoat" Dress. I got it on sale for $3.50 and it has sizes 2-10. The only thing is that it seems long for a size 3. Next time, I would shorten it. I don't like little girls' dresses to be much below the knee. Here's the bodice. Do you think a little blue sash would look good? I'm thinking of fabric, not ribbon.I used my ruffler to make the bottom ruffle, which just makes it so much quicker!! The fabric has its own story. On our way back from vacation, there is an amazing discount fabric store. They have first quality fabrics at crazy prices. For example, I got authentic Sunbrella 60" fabric for my chicken tent there for $5/yd last year. Quilting cottons are $4/yd off the bolt, or $2.49 for flat-folds. We got swimsuit nylon/lycra for $4/yd and gorgeous home dec was $2/yd for flat-folds. I got 100% cotton dotted "Swiss" with real woven dots for $4/yd. I know it's not really the Swiss stuff, but it is lovely! I think I'll have to do a post to show you what I got. Anyway, this sweet toile was $4/yd and I only needed 1 1/4yds, making this a $5 dress! It has a soft hand and is really pretty. My girls said it would make a nice beach portrait dress. I like that it could just be a play dress, too, with simple over-the-head styling and machine wash/dry-ability. I am sure to use this pattern again! Next up, I am pondering a sun suit for my little buddy Andrew and a summer bubble to send to Ella with this dress. First I'll show you my great fabric deals! Lisa, this is so sweet! A blue sash would be the perfect accent for that lovely fabric. Thank you for sharing this! I guess it's a good thing we don't have a fabric discount place in my neck o' the woods :). What a pretty dress! I love the soft blue and the dress is so feminine with the gathered skirt. You are so lucky to have found that discount fabric store! I would love to find some super deals like that around here. Hi, I'm Lisa. I am blessed by my wonderful family: my hubby and 5 fabulous kids: Pete, Katie, Rosie, Davy, and Andy. I love reading, babies, vintage sewing patterns, photography, thrift shops, and movies. I've been sewing for a long time and I like everything from smocking to machine embroidery. I sell vintage patterns and embroideries-take a look! I also work part-time in our schools and belong to a Quilt Guild and a Smocking Guild. I'm never bored! Join me on my adventures! 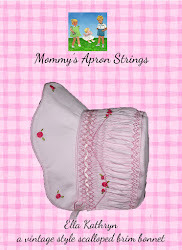 Mommy's Apron Strings reserves all rights to images posted on this site. CLICK TO JOIN MY FB GROUP AND GET THIS FREE PATTERN! 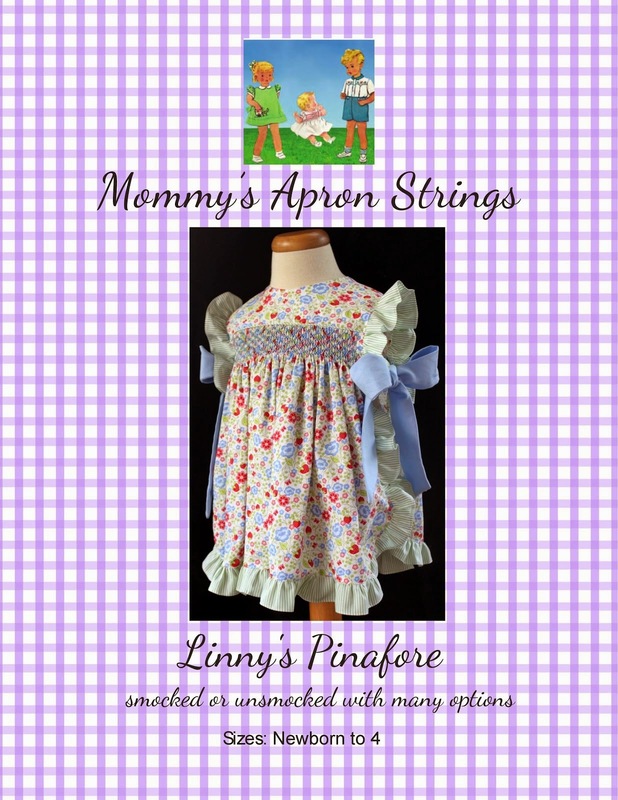 c, 2013 Mommy's Apron Strings. Powered by Blogger.